Why do I keep doing this to myself? I am positive that Charlie Holmberg is a delightful person. She's probably very kind and loves her family and is nice to puppies and all of that. I have no beef with her, I promise. We just aren't compatible when it comes to writing. She has wonderful ideas - fresh and original and exciting ideas. I think she's a talented writer. I'll bet she even bakes chocolate chip cookies for the elderly. Why can't I love her writing? To be fair, I really liked Followed by Frost, which is why I keep coming back to her. However, none of the magician books struck my fancy and this one is a strike out, too. On the positive side, this is an amazing idea, truly one of the most original I've ever seen. But the story is so hard to read. Books on writing talk all the time about torturing your protagonist and not being afraid to be hard on them. Unfortunately, it is possible to go too far down that road. The vast majority of this book is dark and dreary and depressing. The main character is in a hopeless, ghastly position and she's surrounded by other people who are enslaved, raped, and murdered. For most of this book Maire doesn't know who she is or where she came from and the reader is left in the dark along with her. That means that you sit in misery with her for page after page of pain and abuse and despair. 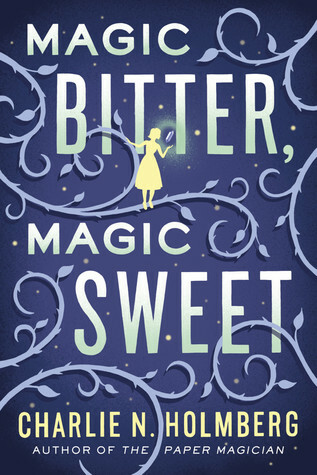 The title promises you bitter and sweet but there is almost no sweet. Even when things resolve, it's too little too late and the explanation is original, but also unsatisfying. The book reminded me of The Handmaid's Tale, which I detest, because the protagonist has so little control over her life and is at the mercy of other's. Even when she escapes, it's because of circumstances rather than her own efforts. 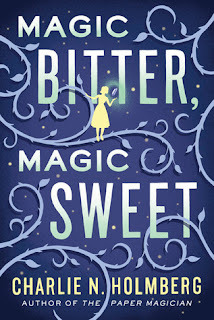 Maire is slightly more proactive than the wimpy woman in Atwood's book, but the author has her so bound by circumstances that she really can't do much. I'm afraid this has to be the end. It's not you, it's me, Ms. Holmberg. I hope that if we ever met we would be friends, but I can't keep reading your books. They're just not for me. If I could have one magic power, and flying wasn't an option, I would want to be able to communicate with animals. I would want to know what they have to say. Second choice... instant teleportation. Unfortunately, I have to live in the real world, so what really matters to me? Books, dogs, computers and learning. Sometimes the order varies, but that pretty much sums it up.
. Simple theme. Theme images by dino4. Powered by Blogger.